This article is about the projectile-launching artillery weapon. For the handheld weapon, see Slingshot. For equipment to launch aircraft, see Aircraft catapult. 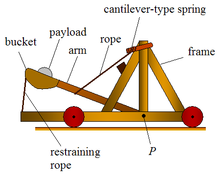 A catapult is a ballistic device used to launch a projectile a great distance without the aid of explosive devices—particularly various types of ancient and medieval siege engines. In use since ancient times, the catapult has proven to be one of the most effective mechanisms during warfare. In modern times the term can apply to devices ranging from a simple hand-held implement (also called a "slingshot") to a mechanism for launching aircraft from a ship. The word 'catapult' comes from the Latin 'catapulta', which in turn comes from the Greek Ancient Greek: καταπέλτης (katapeltēs), itself from κατά (kata), "downwards" and πάλλω (pallō), "to toss, to hurl". Catapults were invented by the ancient Greeks and in ancient India where they were used by the Magadhan Emperor Ajatshatru around the early to mid 5th century BCE. The catapult and crossbow in Greece are closely intertwined. Primitive catapults were essentially "the product of relatively straightforward attempts to increase the range and penetrating power of missiles by strengthening the bow which propelled them". The historian Diodorus Siculus (fl. 1st century BC), described the invention of a mechanical arrow-firing catapult (katapeltikon) by a Greek task force in 399 BC. The weapon was soon after employed against Motya (397 BC), a key Carthaginian stronghold in Sicily. Diodorus is assumed to have drawn his description from the highly rated history of Philistus, a contemporary of the events then. The introduction of crossbows however, can be dated further back: according to the inventor Hero of Alexandria (fl. 1st century AD), who referred to the now lost works of the 3rd-century BC engineer Ctesibius, this weapon was inspired by an earlier foot-held crossbow, called the gastraphetes, which could store more energy than the Greek bows. A detailed description of the gastraphetes, or the "belly-bow",[page needed] along with a watercolor drawing, is found in Heron's technical treatise Belopoeica. A third Greek author, Biton (fl. 2nd century BC), whose reliability has been positively reevaluated by recent scholarship,[page needed] described two advanced forms of the gastraphetes, which he credits to Zopyros, an engineer from southern Italy. Zopyrus has been plausibly equated with a Pythagorean of that name who seems to have flourished in the late 5th century BC. [a] He probably designed his bow-machines on the occasion of the sieges of Cumae and Milet between 421 BC and 401 BC. The bows of these machines already featured a winched pull back system and could apparently throw two missiles at once. From the mid-4th century BC onwards, evidence of the Greek use of arrow-shooting machines becomes more dense and varied: arrow firing machines (katapaltai) are briefly mentioned by Aeneas Tacticus in his treatise on siegecraft written around 350 BC. An extant inscription from the Athenian arsenal, dated between 338 and 326 BC, lists a number of stored catapults with shooting bolts of varying size and springs of sinews. The later entry is particularly noteworthy as it constitutes the first clear evidence for the switch to torsion catapults which are more powerful than the flexible crossbows and came to dominate Greek and Roman artillery design thereafter. This move to torsion springs was likely spurred by the engineers of Philip II of Macedonia. [page needed] Another Athenian inventory from 330 to 329 BC includes catapult bolts with heads and flights. As the use of catapults became more commonplace, so did the training required to operate them. Many Greek children were instructed in catapult usage, as evidenced by "a 3rd Century B.C. inscription from the island of Ceos in the Cyclades [regulating] catapult shooting competitions for the young". Arrow firing machines in action are reported from Philip II's siege of Perinth (Thrace) in 340 BC. At the same time, Greek fortifications began to feature high towers with shuttered windows in the top, which could have been used to house anti-personnel arrow shooters, as in Aigosthena. Projectiles included both arrows and (later) stones that were sometimes lit on fire. Onomarchus of Phocis first used catapults on the battlefield against Philip II of Macedon. Philip's son, Alexander the Great, was the next commander in recorded history to make such use of catapults on the battlefield as well as to use them during sieges. Ancient Indian emperor Ajatashatru of Magadha used catapults against the Licchavis. Ajatshatru is recorded in Jaina texts as having used catapults in his campaign against the Licchavis. King Uzziah, who reigned in Judah until 750 BC, is documented as having overseen the construction of machines to "shoot great stones" in 2 Chronicles 26:15. Castles and fortified walled cities were common during this period and catapults were used as siege weapons against them. As well as their use in attempts to breach walls, incendiary missiles, or diseased carcasses or garbage could be catapulted over the walls. Defensive techniques in the Middle Ages progressed to a point that rendered catapults largely ineffective. The Viking siege of Paris (885–6 A.D.) "saw the employment by both sides of virtually every instrument of siege craft known to the classical world, including a variety of catapults", to little effect, resulting in failure. Special variants called aircraft catapults are used to launch planes from land bases and sea carriers when the takeoff runway is too short for a powered takeoff or simply impractical to extend. Ships also use them to launch torpedoes and deploy bombs against submarines. [dubious – discuss] Small catapults, referred to as "traps", are still widely used to launch clay targets into the air in the sport of clay pigeon shooting. In the 1990s and into the early 2000s, a powerful catapult, a trebuchet, was used by thrill-seekers first on private property and in 2001-2002 at Middlemoor Water Park, Somerset, England to experience being catapulted through the air for 100 feet (30 m). The practice has been discontinued due a fatality at the Water Park. There had been an injury when the trebuchet was in use on private property. Injury and death occurred when those two participants failed to land onto the safety net. The operators of the trebuchet were tried, but found not guilty of manslaughter, though the jury noted that the fatality might have been avoided had the operators "imposed stricter safety measures." Human cannonball circus acts use a catapult launch mechanism, rather than gunpowder, and are risky ventures for the human cannonballs. Early launched roller coasters used a catapult system powered by a diesel engine or a dropped weight to acquire their momentum, such as Shuttle Loop installations between 1977-1978. The catapult system for roller coasters has been replaced by flywheels and later linear motors. In January 2011, a homemade catapult was discovered that was used to smuggle cannabis into the United States from Mexico. The machine was found 20 feet from the border fence with 4.4 pounds (2.0 kg) bales of cannabis ready to launch. ^ Lewis established a lower date of no later than the mid-4th century. So did de Camp. ^ Gurstelle, William (2004). The art of the catapult: build Greek ballista, Roman onagers, English trebuchets, and more ancient artillery. Chicago: Chicago Review Press. ISBN 978-1-55652-526-1. OCLC 54529037. Chisholm, Hugh, ed. (1911). "Catapult" . Encyclopædia Britannica (11th ed.). Cambridge University Press. ^ Liddell, Henry George; Scott, Robert, "πάλλω", A Greek-English Lexicon, Perseus, Tufts, archived from the original on 2013-11-11 . ^ Schellenberg, Hans Michael (2006). "Diodor von Sizilien 14,42,1 und die Erfindung der Artillerie im Mittelmeerraum" (PDF). Frankfurter Elektronische Rundschau zur Altertumskunde. 3: 14–23. Archived (PDF) from the original on 2013-11-03. ^ Singh, U. (2008). A History of Ancient and Early Medieval India: From the Stone Age to the 12th Century. Pearson Education. p. 272. ISBN 9788131711200. Retrieved October 5, 2014. ^ a b Hacker, Barton C, Greek Catapults and Catapult Technology: Science, Technology, and War in Ancient World, JSTOR 3102042 . ^ a b Campbell 2003, p. 3. ^ a b c Campbell 2003, p. 8. 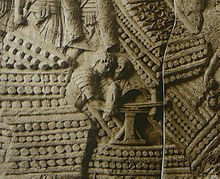 ^ a b c d Cuomo, Serafina, The Sinews of War: Ancient Catapults, JSTOR 3836219 . ^ Campbell 2003, p. 4. ^ Burstein, Stanley M; Donlan, Walter; Pomeroy, Sarah B; Roberts, Jennifer Tolbert (1999), Ancient Greece: A Political, Social, and Cultural History, Oxford University Press, p. 366, ISBN 0-19-509742-4 . ^ Kingsley, Peter (1995), Ancient Philosophy, Mystery and Magic, Oxford: Clarendon, pp. 150ff . ^ de Camp, L Sprague (1961), "Master Gunner Apollonios", Technology and Culture, 2 (3): 240–4 (241), doi:10.2307/3101024 . ^ Campbell 2003, p. 5. ^ Campbell 2003, pp. 8ff. ^ Ober, Josiah (1987), "Early Artillery Towers: Messenia, Boiotia, Attica, Megarid", American Journal of Archaeology, 91 (4): 569–604 (569), doi:10.2307/505291 . ^ Ashley 1998, pp. 50, 446. ^ Ashley 1998, p. 50. ^ Skelton, Debra; Dell, Pamela (2003), Empire of Alexander the Great, New York: Facts on File, pp. 21, 26, 29, ISBN 978-0-8160-5564-7, archived from the original on December 23, 2017, retrieved January 31, 2013 . ^ "Arcuballista", Dictionnaire des antiquités grecques et romaines [Dictionary of Greek and Roman antiquities] (in French), FR: Univ TLSE II, archived from the original on 2008-10-05 . ^ Bachrach, Bernard S (2001), Early Carolingian Warfare: Prelude to Empire, Philadelphia: University of Pennsylvania Press, pp. 110–12, ISBN 978-0-8122-3533-3, archived from the original on December 23, 2017, retrieved January 31, 2013 . ^ Payne-Gallwey, Ralph (2007), The Crossbow: Its Military and Sporting History, Construction and Use, New York: Skyhorse, pp. 43–44, ISBN 978-1-60239-010-2, archived from the original on December 23, 2017, retrieved January 31, 2013 . ^ Singh, U. (2008). A History of Ancient and Early Medieval India: From the Stone Age to the 12th Century. Pearson Education. p. 272. ISBN 9788131711200. Archived from the original on July 3, 2014. Retrieved October 5, 2014. ^ a b c d e f "Catapults", Middle ages, United Kingdom, archived from the original on 2010-09-24 . ^ a b Catapults info, archived from the original on 2002-06-01 . ^ Martin, Brett (August 5, 2013). "Scandal: Extreme Oxford Sports". Vanity Fair. Archived from the original on May 31, 2017. Retrieved November 13, 2017. ^ "Inquest told of student catapult death". The Guardian. October 31, 2005. Archived from the original on January 14, 2015. Retrieved December 8, 2014. ^ "BBC NEWS UK England Oxfordshire - Safety doubts over catapult death". November 2, 2005. Archived from the original on December 11, 2014. Retrieved December 8, 2014. ^ Adams, Cecil (1991-06-21). "The Straight Dope: How do "human cannonballs" survive?". Straight Dope. Chicago Reader. Archived from the original on January 6, 2009. Retrieved November 13, 2017. ^ Weisenberger, Nick (2013). Coasters 101: An Engineer's Guide to Roller Coaster Design. pp. 49–50. ISBN 9781468013559. OCLC 927712635. Archived from the original on 2017-12-23. ^ "Mexican authorities seize homemade marijuana hurling catapult at border", Pop Sci, Jan 2011, archived from the original on 2011-01-30 . Ashley, James R (1998), The Macedonian Empire: The Era of Warfare Under Philip II and Alexander the Great, 359–323 BC, Jefferson, NC: McFarland & Co, ISBN 978-0-7864-1918-0, retrieved January 31, 2013 . Campbell, Duncan (2003), Greek and Roman Artillery 399 BC – AD 363, Oxford: Osprey, ISBN 1-84176-634-8 . Marsden, Eric William (1969), Greek and Roman Artillery: Historical Development, Oxford: Clarendon, ISBN 978-0-19-814268-3 . "Catapult" . Encyclopædia Britannica. 5 (11th ed.). 1911. "Types", Ancient Greek Artillery Technology, DE: Mlahanas, archived from the original on 2016-01-12 . "Catapult Plans and Design", Trebuchet store, Red stone projects . "Animated Catapults", Trebuchet store, Red stone projects . "Medieval Catapult Articles", Medieval castle siege weapons . A Modern Spring Loaded Catapult in Action, FVC3, archived from the original on 2010-04-28, retrieved 2009-10-10 .